LOWER EAST SIDE — Essex Street resident Arnold Acosta literally began to pray for his safety and the welfare of his neighbors earlier this year, just months after a new landlord took over their building. 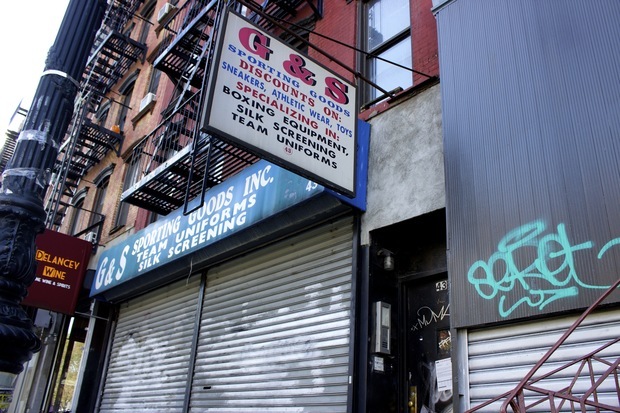 The walls and floors shook as workers illegally demolished a ground-floor commercial space and vacant apartments at 43 Essex St. earlier this year, Acosta said, while “clouds of dust” kicked up by the unpermitted construction work made breathing difficult. “I’m terrified. We don’t know what to think at this point now,” he said. Acosta and four of his neighbors took take their landlord, 43 Essex LLC, to court to stop what they say is a frightening series of illegal construction jobs — including unpermitted work on live gas and electrical lines — as well as weeks without gas, hot water and heat, according to a lawsuit filed last week. The building owner, Paul Galasso of 43 Essex LLC, has racked up 13 violations — seven of them classified as “immediately hazardous,” according to Department of Housing Preservation and Development records, since purchasing the building for $6.9 million in December 2014. Galasso bought it from Rebecca Zerling, whose family owned and operated a boxing shop inside the building for 77 years, according to city records. The violations, which date back to February, include non-working intercoms, peeling paint and a lack of access to hot water, heating and gas, according to HPD’s website. Three stop work orders have also been issued by the Department of Buildings in February and March for illegal work, records show. Construction crews gutted empty apartments and worked on live gas and electrical lines without permits and without notifying tenants, according to DOB’s website. Workers also installed an illegal gas connection that was used to supply a new boiler, records show. The building also has two Environmental Control Board violations related to demolitions conducted without a permit, according to the agency's website. “Tenant harassment is unacceptable and the Department will ensure that every action available in the Building Code is enforced to address nuisance construction that unnecessarily displaces residents," a DOB spokesman said in statement. Acosta, Kam Fung Ma Chen, Tok Fong Chung and Chung Kiu Wong — who are all rent-regulated tenants — want a judge to stop the work, order the landlord to make repairs and to issue a penalty of up to $10,000, according to their lawsuit. The lawsuit said the illegal work compromised the building’s integrity and put the tenants in danger. One resident could peer through the bedroom floorboards into the apartment below, the suit said, while other tenants dealt with cracks in the ceiling as well as and “cracked floor tiles with sharp protruding edges,” according to court documents. Acosta also said the landlord hired infamous tenant relocator Michel Pimienta — who was investigated by the attorney general last year — to intimidate him into accepting a buyout. Pimienta knocked on his door several times, according to the lawsuit. Pimienta also called him late at night and on weekends, he said. “Upon information and belief, these actions constitute harassment and were and continue to be designed to make Petitioners’ lives sufficiently miserable so that they would surrender their tenancy rights,” the lawsuit said. Residents said they started noticing problems at the beginning of the year, when construction began. They were never notified about the work, they said, and the change of ownership was announced in a notice written completely in English even though many of the tenants were older immigrants who only speak Chinese. The tenants began organizing in March with the help of Asian Americans for Equality and Manhattan Legal Services — which are representing them in court — as well as Councilwoman Margaret Chin’s office, they said.